Caption: (oval at bottom right) John Baptiste Trudeau, 1830-1910, One of the Donner's Teamsters. They were the first to take wagons through the new Hastings Cutoff. Although shorter, it was a difficult detour through rugged mountains and arid deserts. The emigrants lost valuable time, oxen, and supplies. One person was banished. Five people died. The mishaps of their journey made them late in reaching the Sierra Nevada mountains. In late October the weary Donner Party started into these mountains. An axle broke on one of the Donner family wagons. The Donners stopped to make the needed repairs. 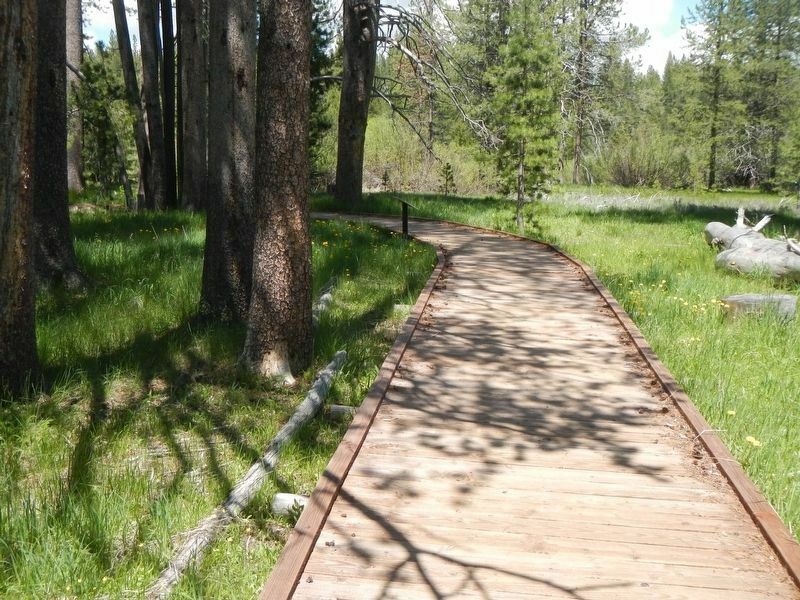 The larger portions of the wagon train continued on reaching Truckee Lake (now called Donner Lake) 6 miles from here. A snowstorm stopped both groups from continuing over the summit. The Donner family and their teamsters were forced to make camp here in the Alder Creek Valley. It was about the first of November, I think, that we went into that camp of snow and suffering. From a statement reported in the San Francisco Morning Call, October 11, 1891. The marker is on the left at the bend in the boardwalk. Location. 39° 22.555′ N, 120° 10.731′ W. Marker is near Truckee, California, in Nevada County. Marker is on California Route 89 near Alder Creek Road. Touch for map. Marker is at or near this postal address: 12893 California Highway 89, Truckee CA 96161, United States of America. Touch for directions. Other nearby markers. At least 8 other markers are within 2 miles of this marker, measured as the crow flies. A Family Heads West (within shouting distance of this marker); Donner Camp Site (about 300 feet away, measured in a direct line); Shelter From the Storm (about 300 feet away); Donner Camp Tree (about 400 feet away); Westward Ho! 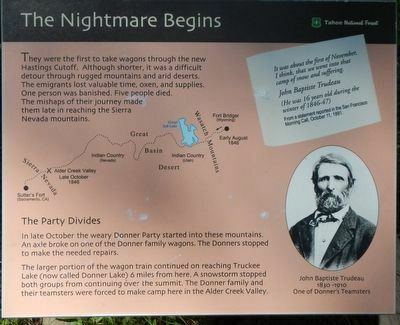 (about 400 feet away); Donner Party Camp at Alder Creek Valley / Tamsen and Elizabeth Donner (about 600 feet away); Hobart Mills (approx. 1.6 miles away); a different marker also named Hobart Mills (approx. 1.6 miles away). Touch for a list and map of all markers in Truckee. More. Search the internet for The Nightmare Begins. Credits. This page was last revised on February 13, 2019. This page originally submitted on February 13, 2019, by Barry Swackhamer of San Jose, California. This page has been viewed 39 times since then. Photos: 1, 2. submitted on February 13, 2019, by Barry Swackhamer of San Jose, California.